With its fine gold Roman brick and great limestone rustication on the first floor on the sidestreet, this building remains handsome despite the removal of some bandcourses and the imposition of a fireescape on its sidestreet facade. 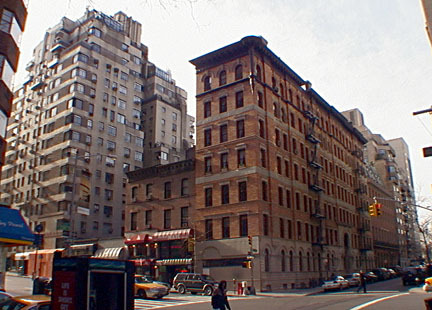 Designed and developed by Thomas Graham, Graham House was completed in 1893 as an apartment hotel and had a first-floor dining room. 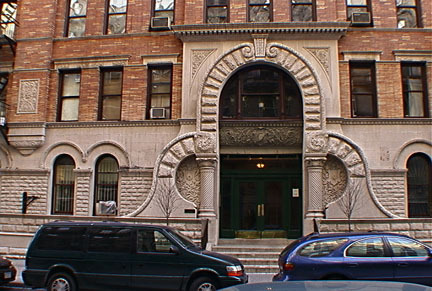 It is distinguished by a great and flamboyant arched entrance and nice facade detailing. It is particularly notable for its fine cornice expecially at the corner where it is supported by a cylindrical pylon. An 1891 illustration of the building in Andrew Alpern's fine book, "Touring the Upper East Side, Walks in Five Historic Districts," indicates that a very thin steeple or flagpole was stop the corner of the cornice. 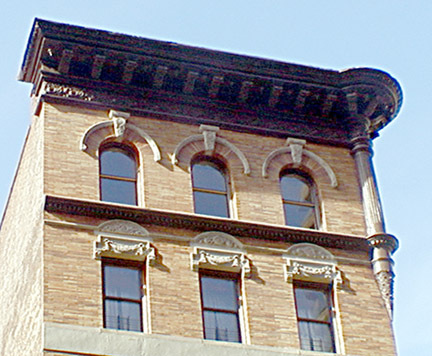 The building, which has arched windows on its top floor, has no doorman, and no garage but is just down the block from Central Park and in the heart of Carnegie Hill.